For many, the prospect of not having access to the cloud is unthinkable. After all, who wouldn’t be drawn to a low-cost, on-demand, scalable and highly flexible service that drives business? Cloud is especially good for larger companies with complicated businesses, because it helps cross-border collaboration which fosters innovation while improving responsiveness and agility. It also facilitates work and internal communication among employees. Lowers spending on software, servers, data centers, etc. Not surprisingly, growth in cloud uptake is strong – and it’s getting stronger. According to Gartner1 , the percentage of organizations using cloud is set to reach 77% in 2017, up from 58% in 2016 – by 2019, it is forecast to reach 85%. Early adopters were smaller businesses, often ones born in the Internet era. These so-called digital natives were the drivers of Cloud 1.0. But with their needs largely met, looking forward, it's the medium- and large-sized companies that will drive development, more so in public cloud as it closes the gap on private, and advances into the Cloud 2.0 era. Companies on cloud: How has cloud enabled my business? Cloud usage by enterprises generally falls into one or more of three formats: private, public, and hybrid. Large companies typically use private cloud; SMEs and individuals tend to use public cloud; and hybrid is a bit of both. As public cloud technology develops, companies will look to transition more of their operations from private to public. It will likely be a slow transition, especially for medium- and large-sized enterprises with complicated business and legacy IT systems. Given the complex nature of their IT infrastructure, production systems, and business process, moving to public cloud is far from being a quick overnight task. One consequence of this is that public, private, and hybrid clouds will need to co-exist for a lengthy period of time. 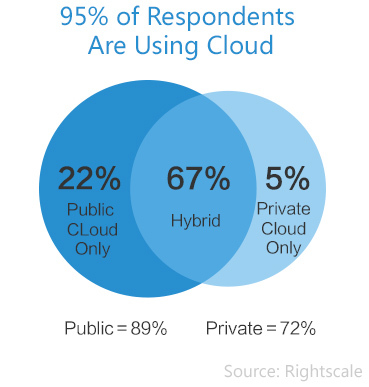 A survey of companies by Rightscale2 showed that 95% use cloud at present – 89% public, 72% private. The findings reflect the popularity of hybrid. Of those surveyed, 67% use hybrid, with just 5% using private only, and 22% using public only. In the end, however, the trend will be with public cloud. Huawei Market Insights (MI) research sees the global cloud market growing about 19% a year over the next five years, with public cloud growing at 21% and private cloud at 18%. In the digital age, data is a core asset for any enterprise. Ownership, privacy, access, security, and storage can all be a source of anxiety for company executives. The prospect of having their company data being accessed without their consent or awareness is enough to give them sleepless nights. And it's not just that; issues such as unplanned outages and security breaches can have broader ramifications. Cloud almost by definition doesn't recognize borders; it's agnostic on jurisdiction. Regulation also differs widely. The US has stricter rules for certain industries, such as healthcare, while the European Union has blanket data privacy laws covering all data. There are multiple jurisdictions and varying levels of regulatory detail that help protect data. That's good, but it can also complicate matters and present significant challenges to businesses, making it vital to work with partners that have a deep understanding of the local regulations. Over decades, medium- and large-sized enterprises have grown their business and accumulated data from traditional IT systems. So, during the process of adopting cloud, they understandably vacillate between the new opportunities and utilizing established systems for the simple reason that they don't want to see previous investments go to waste. They need an open platform to ensure that data is portable and facilitate the transition from legacy systems. 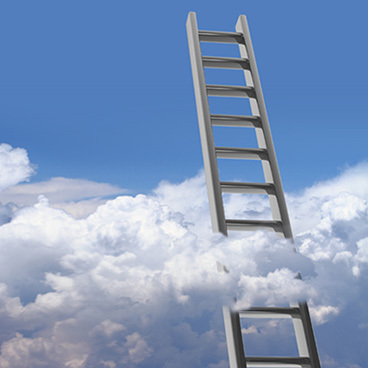 In addition, to avoid putting all their eggs in one basket by being locked in to one provider, businesses are wise to also opt for a multi-cloud vendor approach. To seamlessly work with and switch between multiple partners, businesses need to deploy cloud on an open platform that enables data to be readily moved from one vendor to another. Clear standardized service level agreements (SLAs) are a tool for addressing concerns and making informed decisions. SLAs typically cover commitments to response times, service continuity, bandwidth, security, and so on. That's good, but can SLAs sustain such a high level on cloud? Do cloud vendors have the capabilities to ensure enterprises' businesses can run safely on cloud, for example with preparedness for disaster recovery, system backups, and anti-virus technology and procedures? In addition, enterprises need to abide by a variety of laws and regulations. It is fine when they operate locally; however, after they move the business to cloud, do these regulations still stay relevant considering the complexity of cloud? To medium- and large-sized enterprises with complicated business and legacy IT systems, migration to cloud is a long journey. During this journey, they need complete on-site support with last-mile service capability at any time. For both MNCs and local companies, cloud partners with local service support is vital. For enterprises with multinational operations, it is especially important for their cloud vendors to provide them with access to that local service all around the world. IDC3 forecasts overall expenditure on public cloud to rise at a rate of 21.5% per year through 2020, when it will hit US$203.4 billion worldwide. That's a rate of increase almost seven times that of overall IT spending growth. Vast sums will be spent, but will it be spent wisely? Offer proven local capabilities and on-the-ground support to respond quickly in every step of customers’ journey to the cloud, while also providing complete adoption services, including evaluation of readiness, system transfer and testing, operations & maintenance, etc. Provide up-to-date industry knowledge and strong local partner networks, with a deep understanding of the local lay of the land, including regulations. 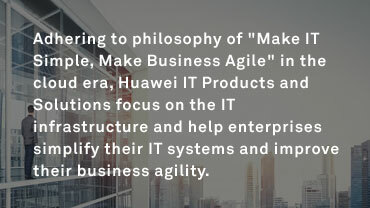 With 20 years of experience serving medium- and large-sized enterprises, Huawei has built up a deep understanding of enterprise business needs. In China, Huawei is the market leader for private cloud, server, storage, and networks. Among the world's Fortune 500 companies, 172 have chosen its services. Of the Fortune 100 companies, 43 are customers of Huawei. Huawei's cloud services help its customers to achieve real bottom-line success. Around the world, with so many different local and regional scenarios, there's no single model that will serve all needs. To support the diversity of its customer base, Huawei operates both the Huawei cloud service and localized joint services with its partners: China Telecom eCloud, Deutsche Telekom Open Telecom Cloud, Orange Flexible Engine, and Telefonica Open Cloud. In all of its business relationships, Huawei fully respects the boundaries between its strengths and services, and its partners' strengths and services. It focuses on its own core strengths, only providing partners with application development platforms and data-processing tools. Huawei does not develop applications within its customers' current areas of business; and it never accesses or use customer data for commercial purposes without permission. Huawei has a number of certifications and qualifications, all of which involved vigorous examination and assessment. These include some of the most stringent in the world: ISO27001 Information Security Management System, TüV Trusted Cloud Service, MIIT Trusted Cloud Service Certification and, most recently, the Cloud Security Alliance® CSA C-STAR Assessment, for which Huawei achieved a gold certification in July 2017. Huawei is among the best-certified cloud providers in China. From private to public cloud, from Huawei cloud to joint-clouds with partners, Huawei embraces the OpenStack open-cloud architecture, which ensures interoperability between clouds. A single API and a single ecosystem enable enterprise customers to migrate smoothly between private and public clouds: an open bridge to the future. Huawei's local service capabilities worldwide help companies to migrate smoothly to the cloud. Besides having local service teams in 170 markets, Huawei works with more than 12,000 partners to provide consulting, delivery, and migration services. Huawei has 12 OpenLabs worldwide to make joint innovation with local partners and provide technical support and validation services. As of the end of July 2017, Huawei has launched a total of 65 cloud services in 10 different categories.4 Huawei cloud and joint clouds with partners serve some of the best known companies in China, Europe, North America, Latin America, South Pacific, and other regions. 4.Huawei's 10 categories are: computing, storage, security, networks, management and deployment, application services, databases, data analytics, software development, and enterprise applications. In 2017, Huawei developed the "National 12315 Internet Service Platform" for China's State Administration of Industry and Commerce. The platform reaches consumers via WeChat, Weibo, or other apps, and enables fast interaction, processing, and response, for a consistent service experience across all channels. The platform can collect and manage customer data from across all channels to facilitate follow-up services. During the 2017 315 Gala Show on CCTV, on global consumer rights day, the platform handled upwards of 210,000 viewer responses per minute. Huawei delivered a future-proofed hybrid cloud solution to Dong Feng Motor Group in 2016. In the first phase, Huawei deployed 300 cloud servers to support all of Dong Feng's office applications. The cloud has the capacity to handle more than 50 simultaneous projects, and over ten thousand external visitors; at the same time it has cut Dong Feng's IT costs by about 30%. Dong Feng and Huawei are together developing a plan for cloudification of all of Dong Feng's key business systems. In the future, they will jointly introduce artificial intelligence to help build complete smart enterprise systems. Philips China enjoys seamless data connectivity with its headquarters in the Netherlands via Huawei's open cloud platform. A local Huawei team provided support to ensure the swift deployment of cloud, and the system has helped Philips to rapidly develop its business in China, especially its healthcare business. Huawei's comprehensive Cloud DevOps platform helps to speed up software development for universities and companies. Chinasoft International's IT crowdsourcing services platform uses Huawei's software development cloud for complete automation of the software development process in four separate environments. New applications can be deployed on the cloud efficiently; contributors can coordinate their efforts; and the development process has become dramatically easier. Since its launch, the Huawei software development cloud has served over 30 universities, more than 300 companies, and 20,000+ developers.